I have heard about Baumeister’s research for years. I am glad I finally read his book. 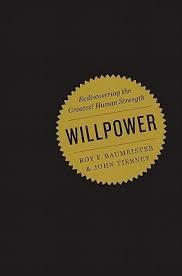 Many of us have heard about “willpower” from parents, teachers, government, business, etc. So what is willpower and how does it affect our daily lives. This book seems timely to me because educators are under attack to do more with less, keep a persona life, continually learn more to deal with a changing world, and keep going while those who don’t teach or lead schools criticize professionals. When psychologists isolate the personal qualities that predict “positive outcomes” in life, they consistently find two traits: intelligence and self-control. Willpower needs to be used to build up our persistence, especially working on important goals. When people feel overwhelmed, their willpower starts to fade. We only have so much energy each day. When our energy is depleted, the less willpower we have to focus on our goals. If everything is left at school, we don’t have much reserve when we get home. This can cause problems in our personal and home life. When my spouse would ask me, “how was your day?” I sometimes would respond, “I don’t want to talk about it, I just had to live through it and don’t want to rehash the day.” Yes, my spouse was trying to be helpful. No, I didn’t have much left to deal with it. Baucom recognized that they needed to leave work while they still had some energy. People were using up all their willpower on the job. Thus was born “ego depletion,” Baumeister’s term for describing people’s diminished capacity to regulate their thoughts, feelings, and actions. When we are depleted, it is much harder to deal with the highs and lows of life. What stress really does, though, is deplete willpower, which diminishes your ability to control those emotions. The researchers concluded that people spend at least a fifth of their waking hours resisting desires —between three and four hours per day. To ward off temptation, people reported using various strategies. The most popular was to look for a distraction or to undertake a new activity. Ego depletion affects even your heartbeat. When people in laboratory experiments exercise mental self-control, their pulse becomes more erratic; conversely, people whose normal pulse is relatively variable seem to have more inner energy available for self-control, be people with steadier heartbeats. I believe this is a case for positivity, mojo, anything that encourages in the workplace. Theory X managers will not achieve the best from our staff or students with high control and punitive measures. Look at the research from Pink, Deci, Harlow, etc. Current literature from Lazlo Bock, Richard Sheridan, Amy Edmondson, Ed Catmull, and others demonstrate that psychological safety is key to getting the best thinking and building a culture of learning. Here is a passage from the book about children. During the first part of the morning, the children who got breakfast learned more and misbehaved less (as judged by monitors who didn’t know which children had eaten). Then, after all the students were given a healthy snack in the middle of the morning, the differences disappeared as if by magic. No glucose, no willpower. Ah, eating is important, sleep is important, and having a supportive environment helps navigate troubled waters. A recent study found that workers who were not getting enough sleep were more prone than others to engage in unethical conduct on the job, as rated by their supervisors and others. 3. Your health suffers, physically as well as mentally. Fuzzy Versus Fussy – One group was instructed to make daily plans for what, where, and when to study. Another made similar plans, only month by month instead of day by day. And a third group, the controls, did not make plans. Which group do you think had better results? Answers, the group that planned by the month. Think about this. There are daily challenges and changes. Mid-course corrections are normal in the fast-paced world of school. Why? Daily plans do have the advantage of letting the person know exactly what he or she should be doing at each moment. But their preparation is time-consuming because it takes much longer to make thirty daily plans than a broad plan for the month without any daily details. Another drawback of daily plans is that they lack flexibility. Life rarely goes exactly according to plan, and so the daily plans can be demoralizing as soon as you fall off schedule. DECISION FATIGUE – The problem of decision fatigue affects everything from the careers of CEOs to the prison sentences of felons appearing before weary judges. They don’t realize that decision fatigue helps explain why ordinarily sensible people get angry at their colleagues and families, splurge on clothes, buy junk food at the supermarket, and can’t resist the car dealer’s offer to rustproof their new sedan. Here is an activity you can try out which is in the book. Look at the following four cases. The results amazed me. What can this tell us about teaching, assessment, and classroom management? Case 1 (heard at 8:50 a.m.): An Arab-Israeli male serving a 30-month sentence for fraud. Case 2 (heard at 1:27 p.m.): A Jewish-Israeli male serving a 16-month sentence for assault. Case 3 (heard at 3:10 p.m.): A Jewish-Israeli male serving a 16-month sentence for assault. Case 4 (heard at 4:25 p.m.): An Arab-Israeli male serving a 30-month sentence for fraud. The prisoners who appeared early in the morning received parole about 70 percent of the time. Those who appeared late in the day won parole less than 10 percent of the time. In midmorning, usually a little before 10:30, the parole board would take a break, and the judges would be served a sandwich and a piece of fruit. That would replenish the glucose in their bloodstreams. (Remember the studies about how children who skipped breakfast would suddenly start to behave and learn better after the midmorning snack?) The same pattern happened with lunch. At 12:30 p.m., just before lunch, the chances of getting parole were only 20 percent, but if you came up right after lunch, the chances were more than 60 percent. Valedictorians are generally not the sort who stay up studying all night just before the big exam—instead, they keep up with the work all semester long. Workers who produce steadily over a long period of time tend to be most successful in the long run. 1. Never go on a diet. 2. Never vow to give up chocolate or any other food. 3. Whether you’re judging yourself or judging others, never equate being overweight with having weak willpower. Researchers have found that the relationship between self-control and weight loss is much less direct than everyone thought. Willpower 101, First Lesson: Know Your Limits – two basic lessons from chapter 1: Your supply of willpower is limited, and you use the same resource for many different things. The willpower you expended on each of these unrelated events depletes how much you have left for the others. Our willpower has made us the most adaptable creatures on the planet, and we’re rediscovering how to help one another use it. We’re learning, once again, that willpower is the virtue that sets our species apart, and that makes each one of us strong. May the willpower be with you.